« The End of Thermionic Valves ? The aim of this paper is to investigate the invention and early development of thermionic valves, the applications they are still used in at present and whether they will continue to play an important role in the future. After more than one hundred years of valve history, thermionic valves have been replaced from many of their traditional applications by smaller, cheaper and better devices. Moreover, new technologies are being constantly developed to achieve better power and economic performance. Therefore, we need to consider three questions. Firstly, are valves going to remain in the present widely used fields, like the magnetron? Secondly, is it possible that valves can be applied back to their traditional fields by improving their performance? Thirdly, in what new areas could the thermionic valve be used for in the future? The birth of electronics as a branch of engineering that exploits the controlled flow of electrons to handle information or energy transmission is closely related to the invention of thermionic valves in the early years of the 20th century. However, before we can review the development of this technology, let us briefly look at its basic structures and operating principles. 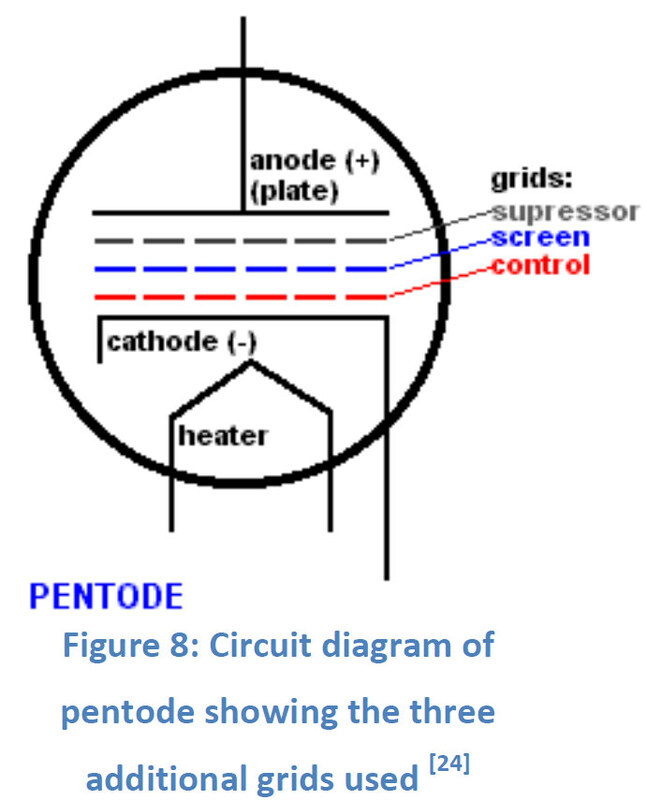 • Anode (P), also known as the plate. • Filament (F), sometimes called the heater. 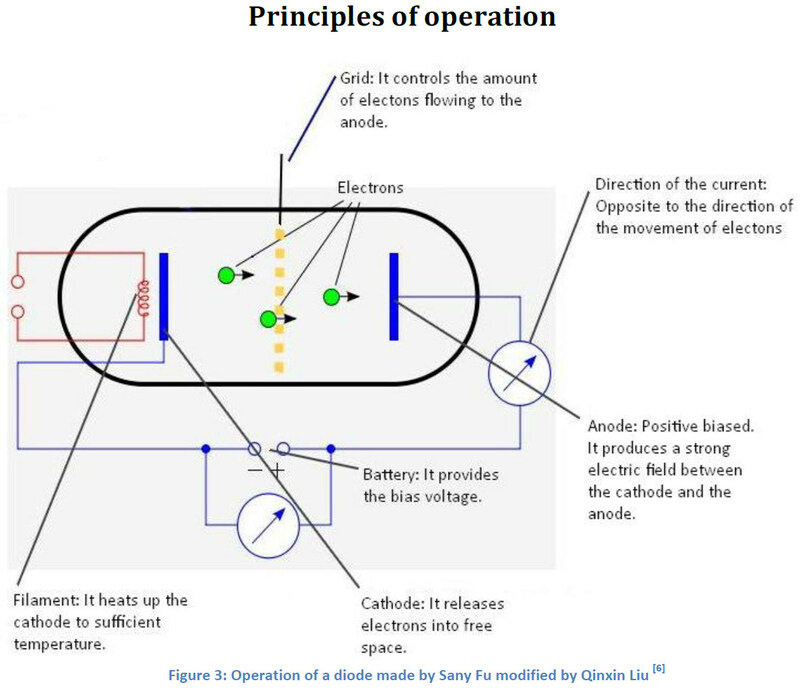 During operation, the cathode emits electrons towards the anode (which is usually held at a much higher potential than the cathode). The filament is a piece of fine wire usually made of tantalum or tungsten. The cathode is heated up so that electrons are released through the process of thermionic emission. The control grid is made of a spiral of fine wire, thus allowing electrons to pass through the grid without colliding into it. It is placed between the anode and the cathode, closer to the latter. By varying the voltage applied to the grid, the electron flow from the cathode to anode can be controlled . 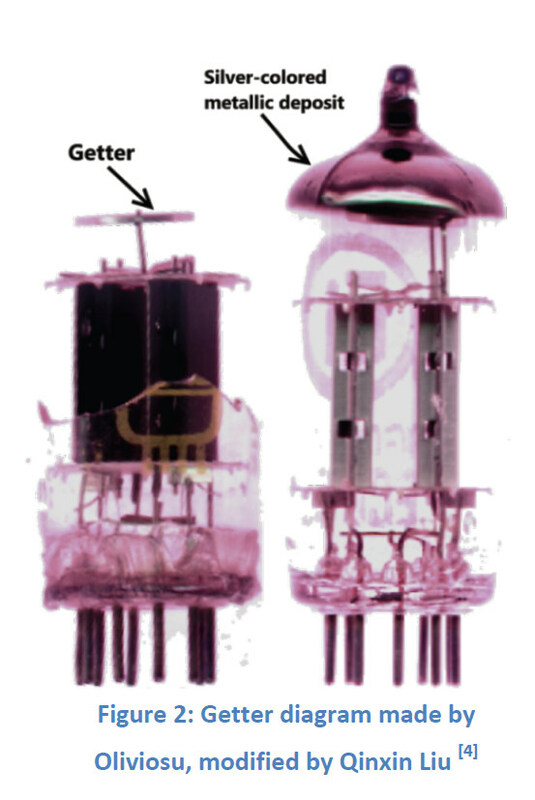 In order to obtain a hard vacuum inside the tube, a modern tube is always constructed with the degassing agent, ‘Getter’ . A getter is generally made of active metals such as barium, aluminium and magnesium alloys. After pumping out the air, the getter is heated by the RF induction. It absorbs the remaining air to form a silver coating on the glass. If the tube is broken or is leaking air, the silver coating will fade away. Disappearance of the silver coating indicates the vacuum tube can no longer be used. In a self–‐heated tube, the cathode is able to heat itself up and emit electrons as a result. This configuration has no external filament, so the cathode is sometimes called a filament as well. In this case the cathode has two terminals (F’ and F) and usually requires a low voltage across and large current through it. As a consequence, this process consumes a large amount of power . Since the tube is highly vacuumed, the heat generated by the electron ejection on the plate can only be dissipated by radiation or through the metal–‐glass junctions. In order to radiate more power, plate surfaces are usually made less glossy and darker. The three electrodes, cathode (K), anode (P) and grid (G) of the triode vacuum tube resemble an NPN semiconductor transistor’s three terminals, emitter (E), collector (C) and base (B) respectively. They have very similar behaviour that will be covered in the section below. G is a constant depending on the structure of the electrodes. Therefore, the current saturates when the anode voltage is high enough that the anode attracts all the electrons released by the cathode. This does not occur during normal operation for a triode (discussed next). A third electrode, grid (G), is introduced inside the tube. It controls the plate current by applying different bias voltages on it. When negative, it repels the electrons coming from the cathode by producing an opposing electric field against the anode. 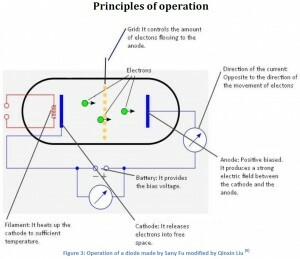 As a result the current flow between the anode and the cathode is reduced. In this case, the grid draws no current. When a positive voltage is applied, however, it enhances the electric field so more electrons can reach the anode. Now the grid draws a small current itself but it is considered negligible. In order to limit the plate current, so it never reaches saturation, the grid is usually negatively biased. The grid sensitively controls the large plate current by drawing a small but negligible current, so it makes the vacuum tube a very powerful current amplifier. 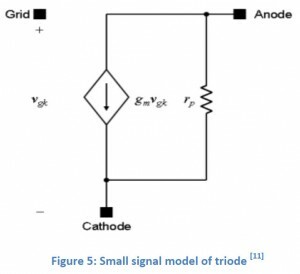 The small signal model of a triode is quite similar to a MOSFET. Instead of the Gate, Source and Drain, the triode has a Grid, Cathode and Anode. By analysing the circuit we can easily derive the maximum (unloaded) voltage gain, μ=gmrp (where gm is the transconductance and rp is the plate resistance) which is exactly what we have for the voltage gain of a MOSFET (|Av|= gm ro) . A typical triode, the 6J5 for instance, has a μ of 20, gm of 3.0mS and rp of 6.7kΩ. As compared to a transistor, the transconductance and the maximum voltage of a triode seems a lot smaller. However, the triode is a very good power amplifier as the grid can control a large current using negligible power. In 1883, Thomas Edison, in his attempt to improve incandescent lamps, inserted a metallic plate into an evacuated tube and observed that a current flowed between the electrode and the filament when a positive voltage was applied to the electrode. When a negative voltage was applied, though, no current flowed. This would come to be known as the Edison effect. 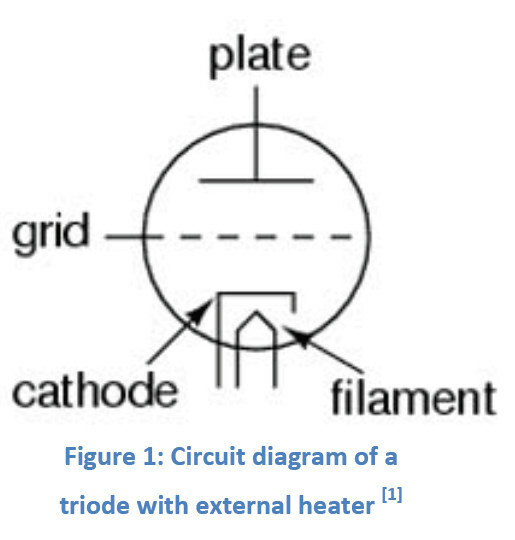 Thus, a thermionic diode was invented, however it was initially only used as a regulator of voltage across the filament of incandescent lamps . John Ambrose Fleming studied the Edison effect and mentioned the rectification of low–‐frequency signals by the thermionic diode in his paper as early as in 1890. When he was later involved in the radio transmission experiments carried out by Marconi Wireless Telegraphy Company, he realised that the rectifying property of the diode could be used in the detection of high frequency radio waves and got a patent in 1904. The detected signals were still quite weak, and long distance communication became possible only with the invention of the triode by Lee De Forest in 1907. 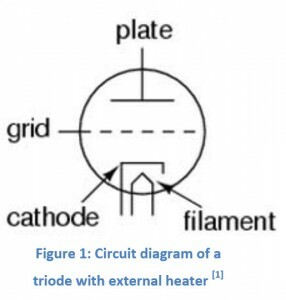 He showed that inserting an extra grid into the tube provided control of the current flow between the cathode (filament) and the anode (plate). This device, called ‘Audion’ by Lee De Forest, was the first electronic amplifier and was used for detection of high frequency oscillations. The Audion was quite a sensitive detector, however its operation was not stable because it contained some residual gas. 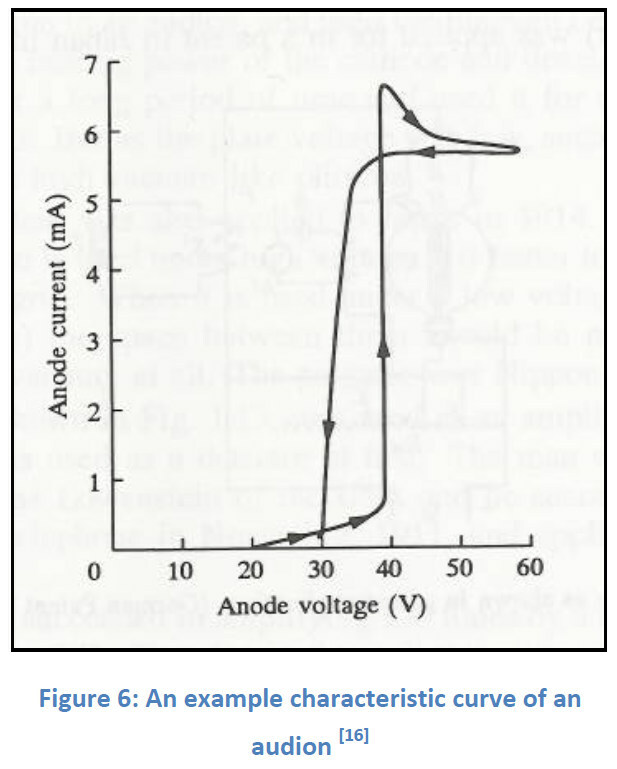 As it is shown in the characteristic of the Audion (figure 6), at a certain anode voltage there is a rapid increase in the anode current due to the onset of ionization of the residual gas; hysteresis is also explained by poor vacuum conditions. Because of the gas discharge, the sensitivity of the Audion decreased over time and it had to be readjusted . The triode was first used as an amplifier by Lowenstein in the USA and later in 1912 De Forest was able to use a three stage Audion amplifier to get a gain of 120 . Around 1913, it was realised that feedback could be used to make the triode into a better amplifier of high frequency signals or a generator of oscillations. Under the impression that the residual gas was important in the operation of a thermionic valve, Lieben and Reisz developed a gas discharge tube in Germany in 1910, which is considered to be the first thyratron. Mercury vapour was sealed inside the tube and the cathode contained calcium oxide . 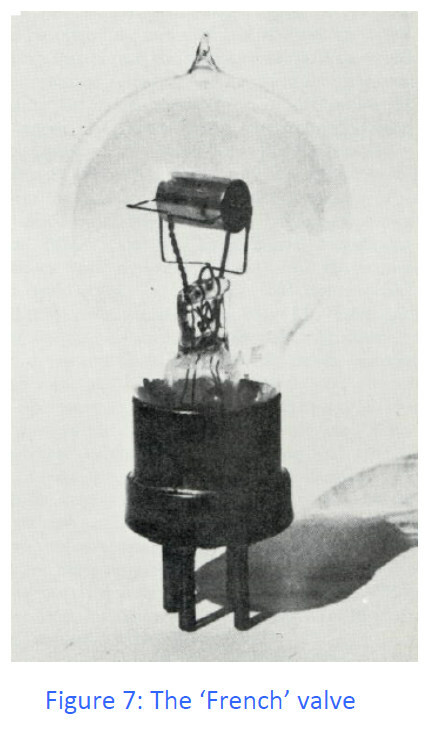 The thyratron, a high current and low–‐pressure tube, was later developed by Albert Hull. This invention was the origin of controlled electronics. In the decade following the invention of the thermionic valve, there was a controversy in the understanding of its operation. As the vacuum techniques were poor at that time and many experiments were not repeatable, some scientists believed that thermionic emission depended on the chemical reaction between the ionized gases and the oxide cathodes, whereas others considered thermionic emissions to be the fundamental property of metals. This controversy was resolved by Irving Langmuir, who managed to get a rather low vacuum and using Richardson’s theory of thermionic emission, showed that the anode saturation current is limited by the space charge effect and that the relationship between the anode current and the anode voltage obeys the so–‐called three–‐halves power law . This work, as well as the advances in pumping techniques, led to large scale production of high vacuum three–‐electrode receiving tubes during World War I. 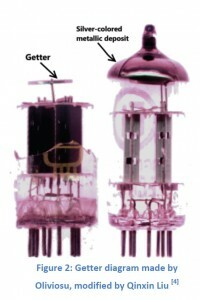 Subsequently, radio receivers based on thermionic valves that acted as rectifiers, were able to replace their predecessors that used galena crystals. also oxide–‐coated cathodes were introduced both by Langmuir and Arnold, which greatly increased emission and therefore enhanced the anode current. Langmuir used a thoriated tungsten filament whereas Arnold put barium oxide on platinum wire. These oxide cathodes later became very important for high–‐power transmitting tubes . By the end of World War I which boosted the production of vacuum tubes for military uses, their operation had been thoroughly described. The annual production of electron tubes reached 300,000 for France, Britain and Germany by 1918 . Stability of operation was a major requirement so soft vacuum tubes went entirely out of use. Valves could now be designed for particular purposes by modifying their internal structures and physical characteristics. A few discoveries played an important role in this. 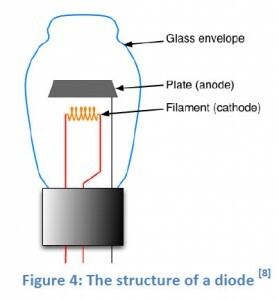 Firstly, it was realised that the cathode current depended on the space charge, which was determined by the electric field induced by the grid and anode voltages. Secondly, amplification constant μ was introduced. The most successful wartime tube is the so–‐called ‘French’ valve developed by Ferrie. It consisted of a spherical bulb in which a straight tungsten filament, a helical molybdenum or nickel grid and a cylindrical nickel anode were arranged horizontally. It was widely used in receivers by the Allied armies . With the triode, communication techniques and broadcasting developed to a huge extent, but it had its limitations. The grid–‐anode capacitance caused coupling between input and output and limited operation frequencies. As shown by A. Hull in 1926, inserting a screen grid between the control grid and the anode could lower this capacitance. Prior to this, Schottky suggested a four–‐electrode structure in 1916, but his aim was to increase the amplification factor . This type of tube was logically named the tetrode. The grid was usually held at a constant positive voltage and bypassed to the anode by a capacitor. By shielding the control grid and anode, it minimized the undesired feedback and oscillation hence reduced the capacitance between them (from 5pF down to about 0.01pF). It also increased the plate resistance (reaching 1MΩ). As a result, the maximum voltage gain increased and the high–‐frequency gain also improved. The tetrode had a disadvantage, secondary electrons emitted from the plate by the bombardment ceased to return to the plate but were attracted by the screen grid when it was at higher potential than the plate. 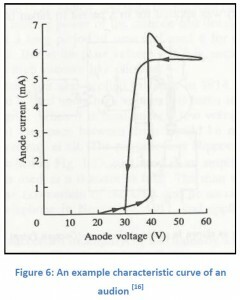 This phenomenon resulted in the disruption of the linear relation between anode current and anode voltage, narrowing the range of operation. Moreover, when the grid current formed by the secondary electrons gets high enough, it will damage the grid causing it to melt down. 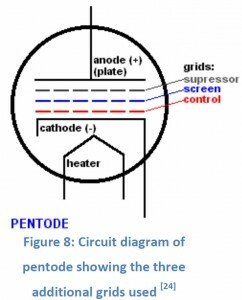 A third grid, the suppressor, held at zero or negative potential between the screen grid and the anode was suggested by Tellegen and Holst of Philips Company in 1926, making up the configuration of the pentode . With the pentode, the thermionic valve obtained its final form. Hexodes, heptodes and octodes which followed did not introduce any particular new physical principal but rather combined functions of different tubes under one glass envelope. An example is the pentagrid converter type 2A7 developed by the company RCA in 1933, which was used for frequency conversion in superheterodyne radio and television receivers. In this tube, all the elements were located in a radial manner around the cathode in the following sequence: oscillation grid, oscillation anode, first screen grid, control grid, second screen grid and anode. The cathode, oscillation grid and oscillation anode composed the triode used for local oscillation; the generated AC voltage signal was coupled to the control grid where it is mixed with the input radio signal. The difference between the generated signal and the input signal gives the output signal of the intermediate frequency which is more convenient to process. The same tube could be used to provide gain control of the mixer stage, so that the output is not distorted when the input signal is too strong or too weak. This is known as ‘variable–‐μ’ operation and is achieved by applying two separate voltages to the control grids . Early computers and the invention of the transistor: Up to the period we have so far examined, vacuum tubes had clearly been developing at a rapid pace. This resulted in increased functionality that directly led to tubes being used in more and more applications. 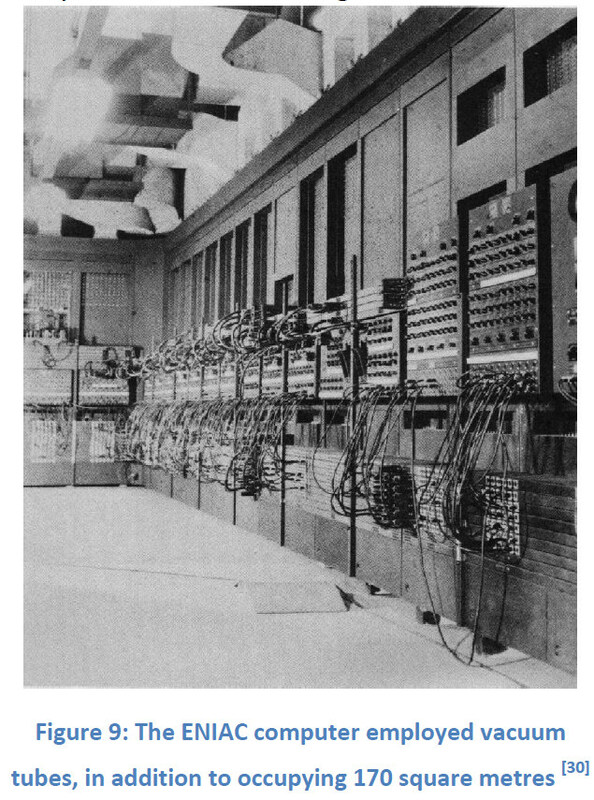 In 1946, one of the first major electrical computers, ENIAC (Electrical Numerical Integrator And Calculator), was built. It was funded by the US military, who planned to use it to calculate complex artillery–‐firing tables to improve the accuracy of their weapons. The computer employed almost 20,000 valves and was able to perform calculations considerably faster than earlier mechanical models . Valves had played a significant part in yet another important application. However, the ENIAC had several major problems that were closely tied to the valves it employed. These included its incredibly large power consumption (160kW) and physical size (it weighed 30 tons) . These disadvantages, in addition to frequent maintenance it required to remain operational, strengthened the interest in alternative devices that could fulfil the functions of tubes more effectively. This directly led to the eventual invention of the transistor in 1947 . Although tubes would still be widely used for several more years, transistors had several advantages over their valve predecessors that clearly made them more suitable for certain applications. These included their small size, lower possible operating voltages, lower power dissipation and no warm–‐up period. All direct results of the transistor not having to rely on wasteful heating to begin conducting . These in addition to the invention of the integrated circuit, a method that would allow more and more transistors to be packed onto a small chip, meant that valves were completely replaced in the field of computers . The application of tubes in computers in the late 40s and early 50s corresponds to their peak usage. In the years to follow, leading to the present day, valves would be slowly replaced by the transistor. However, as we shall see in the next section, despite being less visible in our day–‐to–‐day lives, tubes presently still play an important role in several applications.